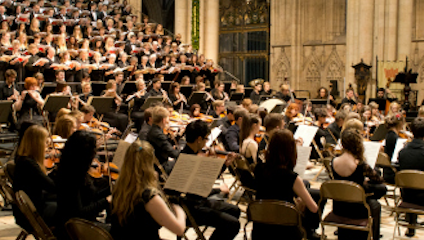 York Minster’s final concert of the season simultaneously marks the centenary of the conclusion of World War I with Benjamin Britten’s War Requiem. Interspersed with poems by World War I poet Wilfred Owen, the traditional Latin mass text will be performed by The University of York Choir & Symphony Orchestra, including three soloists Catrin Woodruff (soprano), James Gilchrist (tenor) and Stephan Loges (baritone). Britten’s War Requiem was commissioned to premiere at the consecration of St Michael’s Cathedral in Coventry. Heavily damaged during the Coventry blitz of 1940 alongside thousands of homes and many of the city’s factories, the cathedral was rebuilt by architect Basil Spence on the site of the original building in 1962. Despite its divisive critical reception and Britten’s uneasy status as a conscientious objector, Britten was deeply engaged in the tragedy and the ‘pity’ of war, utilising Owen’s poetry as a means of expressing its painful futility. For Britten, his approach to this subject was necessarily detached from musical concerns. Rather, he wished to express a deeper message; one that the public attending this grand unveiling might appreciate, sitting on the site of a terrible destructive act of war, and in light of the numerous subsequent acts of violence and destruction they’d been witness to. All a poet can do today is warn." Like Owen then, Britten’s piece was perhaps also intended as a warning. If ‘poetry is in the pity,’ so too is pity found in Britten’s musical composition. Weaving together numerous different musical registers, the ultimate integration of the disparate elements reveals only a tentative resolution: ‘Let us sleep now.’ The audience are left to contemplate whether these simple words provide a sense of hope or impending doom. A cathedral also affected by the War, York Minster’s stained glass windows were famously removed and put into storage to protect them from the Zeppelin raids. It is perhaps particularly appropriate then, that on 17 June, you can witness Britten’s searing reminder of the horrors of war within a masterful example of architecture that was almost destroyed at the hands of it. Commemorating this important historic event within one of the world’s most magnificent cathedrals, to the sounds of one of the greatest choral masterpieces of the 20th-century (performed by The University of York Choir & Symphony Orchestra), is the perfect opportunity to reflect on the past and, in the spirit of Britten, to consider our current attitude to the ‘pity’ of war. Britten’s War Requiem is being performed at York Minster on Wednesday 20 June 2018, from 7:30-9pm. Tickets: £14-£25; Concession £12-£23; Students £5.